Condition Varies from good to very good. Similar to photo. Personal Cheques have to clear before goods are released. Stand-alone software could also be downloaded through the PlayStation console. The software is then transferred to the PocketStation for use. Item:Sony PocketStation. It was released exclusively in Japan on January 23, 1999. Up for sale: The Sony PocketStation PlayStation White (SCPH-4000). The box has a little shelf wear but is sturdy and intact. The strap is in excellent condition, and the manual is in very good condition as well with no tears on it. Sony Pocketstation PS1 White SCPH-4000 Official Tested Complete!! No batteries included. Sony Pocketstation PS1 White SCPH-4000 Official Tested Complete!!. Condition is Used. Shipped with USPS First Class Package. SONY PlayStation. BOX and Manual. Pocket Station White. This item is JAPANESE VERSION. Condition Varies from good to very good. Condition Varies from good to very good. No Foreign Cheques. Similar to photo. Personal Cheques have to clear before goods are released. Up for a rare SONY Pocketstation Crystal for PlayStation 1. VERY IMPORTANT! ■Platform: SONY PlayStation. ■Region Code: NTSC-J (Japan). ■Made in Japan. Asia Free! Middle East Free! I live in Fujisawa Kanagawa Japan. Fujisawa is next to Kamakura. Kamakura is Samurai city The city was made by the samurai about 800 years ago.And then I enjoy reading and swimming, and I like dogs and Italian food. Playstation NTSC-J. POCKET STATION White SCPH-4000. Pocket Station. Pocket Station - B. Pocket Station x 1. Condition ----- GOOD(A-B-C-D-E)BAD. Playstation Sony　NTSC-J. Pocket Station - C. Pocket Station x 1. Playstation 1 Pocket station Crystal. Japan Version. Playstation 1 Pocket station Crystal. Japan Version. Working Tested. Stand-alone software could also be downloaded through the PlayStation console. The software is then transferred to the PocketStation for use. It was released exclusively in Japan on January 23, 1999. 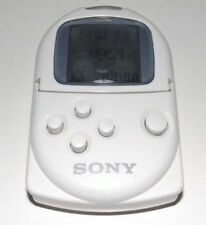 Playstation 1 Pocket station White. Japan Version.